Harmful algal blooms (HABs) occurring in freshwater, and the associated toxins they produce, are dangerous to animals and humans. Mitigating the increasing presence of HABs presents a major challenge to water managers and drinking water utilities across the world. This book explores the current research on removal of HABs and toxins from drinking water. It provides the necessary tools so that treatment plant operators, engineers, and water managers can understand the vulnerability of drinking water treatment plants to HABs and develop treatment processes to minimize the impact of these contaminants. Although conventional treatment processes can be effective for the removal of HAB cells and some HAB toxins under optimal conditions, the potential exists for significant breakthrough of toxins during normal operation. As a result, there is a recognized need for more advanced techniques. Possible advanced processes for removing HAB toxins include granular activated carbon (GAC), powdered activated carbon (PAC), or oxidative processes. This book reviews both conventional and advanced treatment processes and presents clear and easy-to-understand procedures for the design of systems for optimal cell or toxin removal. Harold Walker is director and professor of civil engineering at Stony Brook University. Prior to coming to Stony Brook, Dr. Walker was a professor in the Department of Civil, Environmental, and Geodetic Engineering at The Ohio State University. Dr. Walker also served as the director of the Ohio Water Resources Center, the federally authorized and state-designated water resources research institute for the state of Ohio. Dr. Walker served on the board of directors of the National Institutes for Water Resources as well as on the board of directors for the Water Management Association of Ohio. Dr. Walker is a registered professional engineer in the state of Ohio. He has a BS in environmental engineering from Cal Poly San Luis Obispo and MS and PhD degrees in civil and environmental engineering from the University of California, Irvine. Dr. Walker’s research focuses on understanding surface chemical processes in natural and engineered systems, with an emphasis on clean water. Current areas of research include predicting the fate and transport of manufactured nanomaterials, cyanotoxins, and other "emerging" contaminants in groundwater, lakes, oceans, and water treatment plants; developing novel membrane treatment systems and membrane cleaning approaches; and determining the vulnerability of the public to cyanotoxins in finished drinking water. Dr. Walker has secured external funds to support his research from a number of sources, such as the National Science Foundation (NSF), US Environmental Protection Agency (USEPA), United States Geological Survey (USGS), Department of Energy (DOE), National Oceanic and Atmospheric Administration (through Sea Grant), and a variety of state agencies, industries, and other sources. 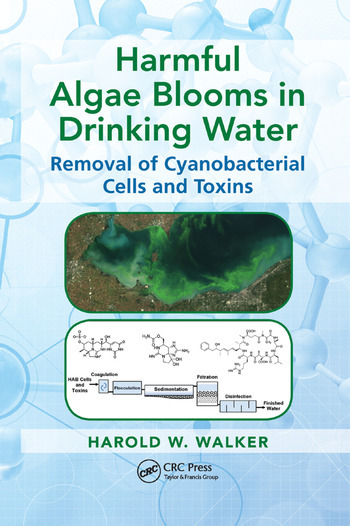 "Harold Walker’s Harmful Algae Blooms in Drinking Water: Removal of Cyanobacterial Cells and Toxins is well written and easy to understand. This book is a great resource for students, managers, water treatment plant operators, anglers, and beach users. With this book, Walker clearly explains the biggest water quality problem of the twenty-first century and its solutions." "This is an excellent book for people to learn the general aspects about harmful algal blooms, cyanotoxins, their occurrence, and treatment."